It’s getting colder here in Berlin, all of the trees in front of our windows are finally naked, their last colourful leaves swept away in a single stormy night. Before the winds came, the light in our living room was golden and warm, filtered through autumn’s pretty yellow linden leaves. Now that they’re gone, the light is much harder. All of a sudden, the city seems a bit more harsh, which made me long for a cozy soup. 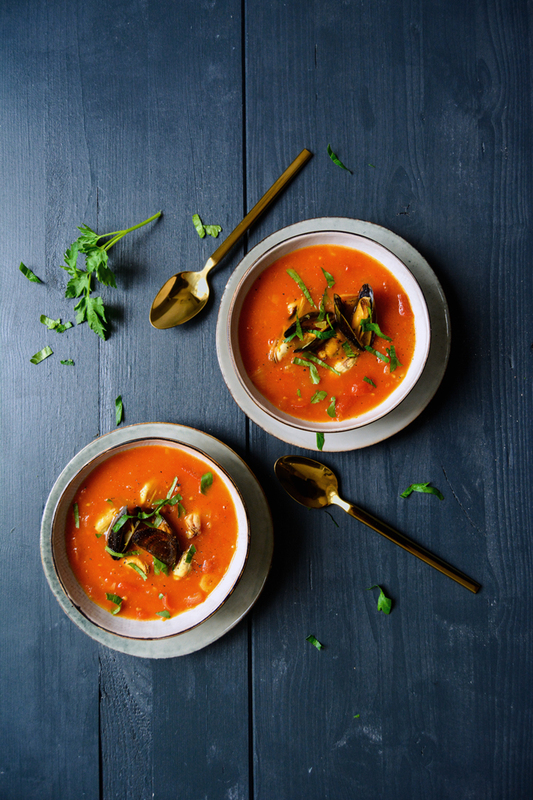 Seafood has been on my mind for weeks, sweet mussels from the North Sea, adding their fine taste to a thick, fruity tomato soup refined with aromatic saffron. It warms the body and caresses the soul, what else could you want on a cold and misty November day? This dish may seem elaborate but that’s not at all the case, it’s a quick one. 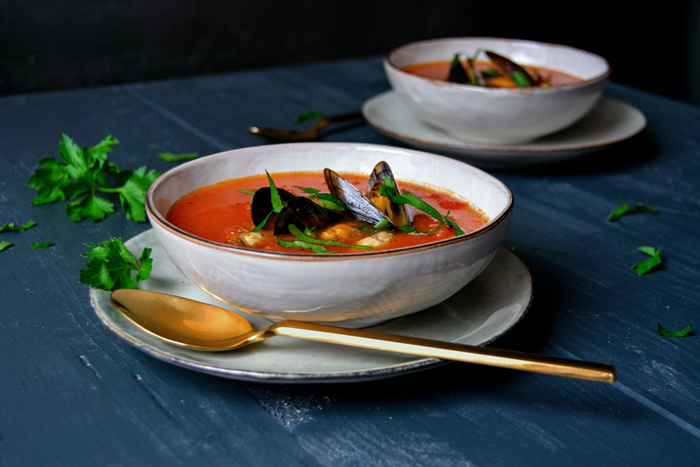 The fruit’s red juices only cook for a bit longer than 10 minutes and the mussels sink into a fragrant broth of white wine and spices for just 5 minutes. 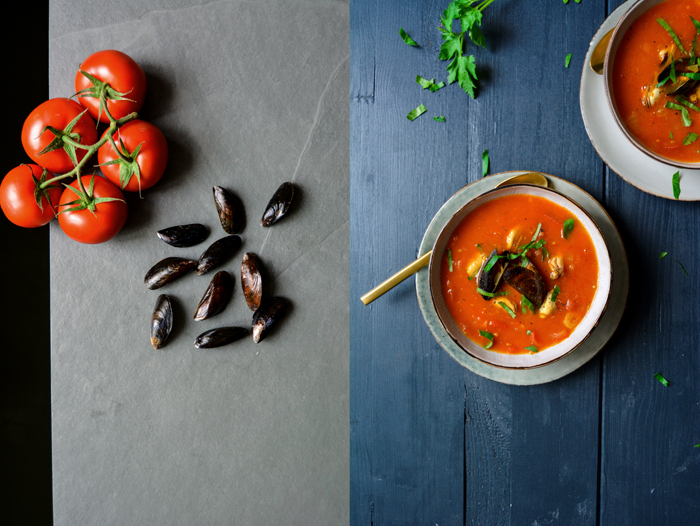 I use the wine, infused with a soft hint of the sea and the noble taste of saffron, to stir into my glowing soup. It’s supposed to serve 3-4, which I still believe is quite realistic, but we loved it so much that we almost emptied the large pot of soup in one go at lunchtime. We were hungry. For the mussels, heat a splash of olive oil in a large pot and cook the onion and garlic on medium heat for a few minutes or until golden and soft. Add the wine, bay leaves, saffron, salt and pepper, stir and bring to the boil. 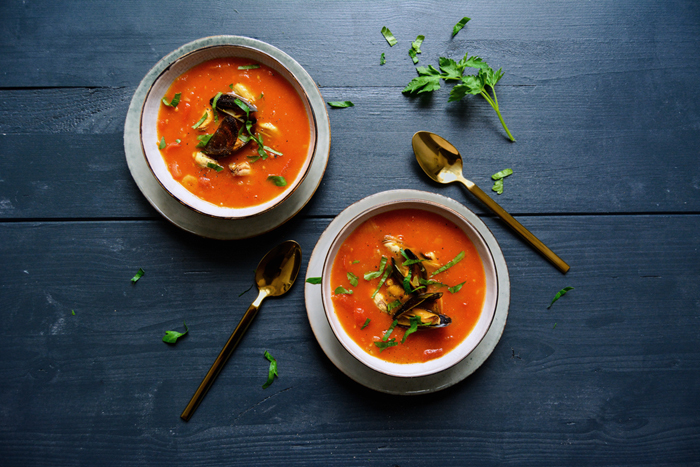 Turn the heat down to low, gently add the mussels to the pot, shake the pot or stir with a slotted ladle and close with a lid. Cook for 5 minutes or until the shells open, shake the pot once or twice while cooking. Take the mussels out with a slotted ladle, discard any mussels that don’t open. Measure 400ml of the mussel broth, together with the onions and the bay leaves, and set aside. 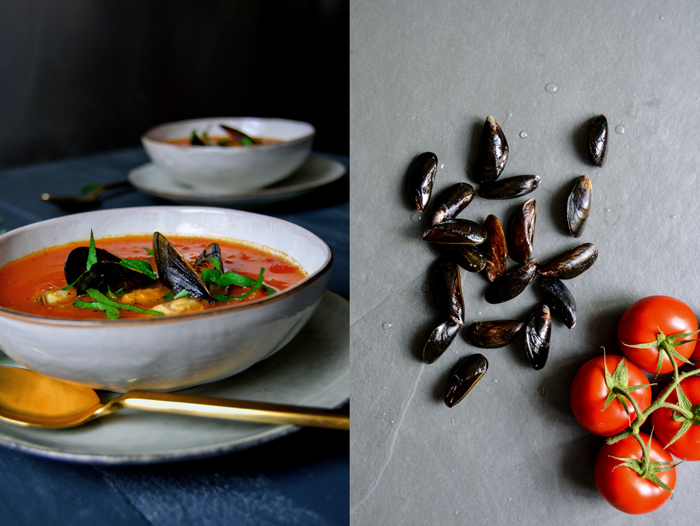 Peel the mussels out of their shells, leave about 6-8 inside the shells for the topping of the soup (optional). Set the mussels aside. Heat a splash of olive oil in a large pot, add the tomatoes and garlic and cook for 4 minutes on medium-high heat (open), stir once in a while. Add the mussel broth with the onions and bay leaves, sugar, salt and pepper and cook for about 7 minutes (open) or until the tomatoes are soft and the soup is thick. Season to taste and, if necessary, chop the tomatoes with a knife if they are too chunky, or purée the soup in a food processor. 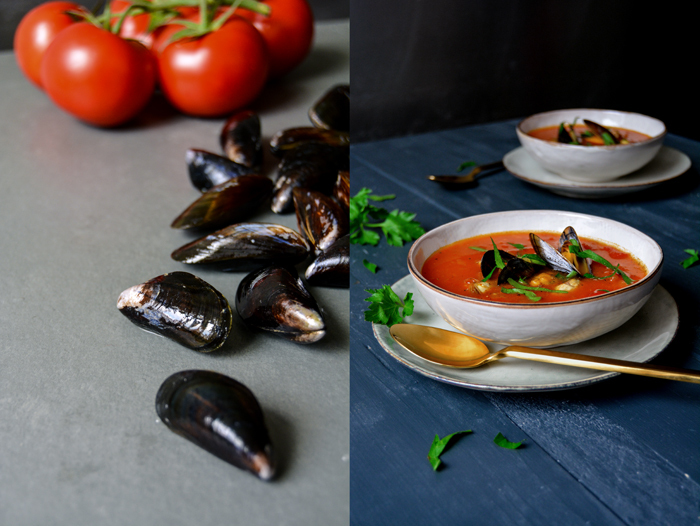 Stir in the mussel meat, divide the soup between bowls, sprinkle with fresh parsley and pepper and garnish with the mussels in their shells. we have some of the most incredible seafood i have ever experienced here in the pacific northwest region of north america. the sweet succulent mussels here are for sure in my top ten things to devour from the sea. this brings me to type for the billionth time… how on earth did i not think of putting them into a simple saffron tomato soup construct (another favorite of mine)?!? i might be making this tonight instead of the garlic butter spaghetti. you are driving me mad with your cooking self, meike. 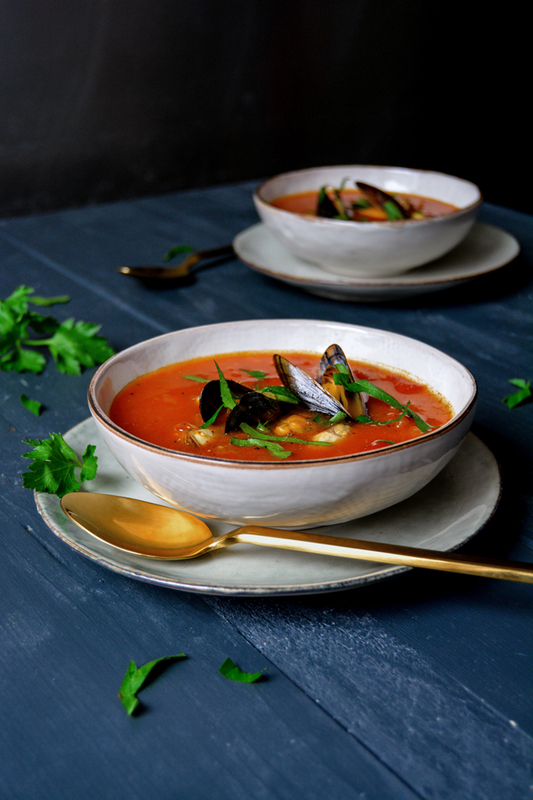 Usually I just cook mussels in a spiced broth but they are absolutely delicious in this soup! You should try this!